WHAT IS THE UNIVERSE TRYING TO TELL YOU? LET THE WORLD S MOST POWERFUL CURSE BREAKERS SHOW YOU HOW TO PROTECT YOURSELF FROM EVIL AND ATTRACT GOOD LUCK! Do you sometimes feel like you ve locked horns with the Devil? Does it seem like you ve been jinxed that someone has put the double whammy on you? Now you can finally be free of all misfortune as Good Luck is just around the corner! For centuries, people have been closely observing the world around them in the belief that certain events could foretell the future. These signs are called Omens, and their meanings have been handed down from generation to generation. Did you know it is considered good luck when you find a spider in your house at night? Or that a crowing hen signifies bad fortune? Many people still think that carrying a magnetic lodestone will protect them from evil and curses. This work will teach you how to remove ALL Hexes from your life Surround yourself with Pure White Light and the Blessings of the Creator. There are Laws of the Universe, designed to protect you and cancel out all negativity from those who wish you band luck and misfortune. The Evil Eye, Curses, Black Magic will never trouble you again! Here are literally dozens of curses and superstitions along with the spells and rituals that will enable you to vanquish bad luck, know the future and create a better, happier life for you and your loved ones. 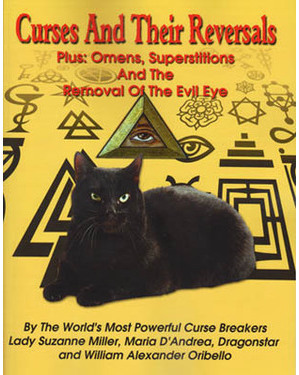 Includes such popular superstitions as: -- Signs of Good or Bad Luck The meaning of dogs howling and owls hooting Signs of approach bad health and death How to remove and protect yourself from the Evil Eye Special Birthdays Card playing and gambling The meaning of Lucky Gemstones and MUCH MORE!